The Union Minister for Science & Technology, Earth Sciences and Environment, Forest & Climate Change, Dr. Harsh Vardhan addressing at the 23rd World Ozone Day celebrations and 30th Anniversary of Montreal Protocol, in New Delhi on September 16, 2017. New Delhi: Highlighting the strength of the active collaboration between the government, industries and all stakeholders in the implementation of Ozone Depleting Substances (ODS) phase-out programme in the country, Union Minister of Environment, Forest and Climate Change, Dr. Harsh Vardhan highlighted the importance of individual awareness and the strength of collective action. The Minister also laid special emphasis on the role played by children in ensuring the success of such campaigns. 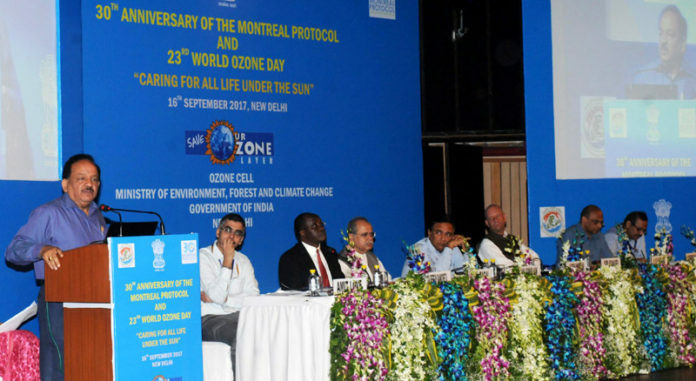 Addressing a gathering at the celebrations of the 30th anniversary of the Montreal Protocol and 23rd World Ozone Day here today, with the theme – “Caring for all life under the Sun”, the Minister made a special mention of the pan-India awareness campaign launched by the Environment Ministry on the occasion. This campaign was among the most widespread engagements of the Ministry for awareness generation, carried out with the active partnership of States through schools and academic/research institutions spread across the country. The awareness campaign saw a participation of about 28 lakh students in more than 13, 000 schools and reached out to 214 districts across 16 states of the country. The Minister also spoke of the strong policy leadership given by India during the negotiations for the Kigali Amendment to the Montreal Protocol. Dr. Harsh Vardhan said that it is recognized that India played a crucial role in the adoption of the Kigali Amendment to the Montreal Protocol. A series of publications launched by the Minister on the occasion include – a handbook on HCFC Phase-out and Energy Efficiency in Buildings; the first edition of ‘newsTRAC; and a newsletter for service technicians in Refrigeration and Air-conditioning (RAC) sector. These two publications were launched as part of the enabling component of India’s HCFC Phase out Management Plan, for which United Nations Environment is the cooperating agency and Energy Efficiency Services Ltd. and The Energy and Resources Institute (TERI) are the national implementing partners. Two videos on India’s achievements in implementation of Montreal Protocol and HCFCs phase-out and Energy Efficiency in buildings were also launched. The year 2017 marks the 30th Anniversary of the Montreal Protocol on Substances that Deplete the Ozone Layer. The Montreal Protocol is one of the most successful global environmental treaties, the implementation of which has not only led to the phase-out of around 98% of ozone depleting chemicals, but also averted more than 135 billion tonnes of carbon dioxide equivalent emissions. Nearly 2 million cases of skin cancer per year have been averted globally. The Montreal Protocol is the only environmental treaty which enjoys universal ratification of 197 UN member countries. During the Kigali negotiations, India piloted the concept of two base lines and a differentiated phased down time schedule to factor in the needs of developing countries. This was the first time in the Montreal Protocol that the concept of two baseline has been adopted both for developed and developing countries. On India’s initiative, energy efficiency was included for the first time in the Montreal Protocol as an agreed finance solution while phasing down HFCs. India has consciously chosen a path for most environment-friendly and energy efficient technologies, while phasing out Ozone Depleting substances, unlike many of the developed countries. India is among the few countries globally and a pioneer, in some cases, in the use of non-ODS low Global Warming Potential (GWP) technologies.